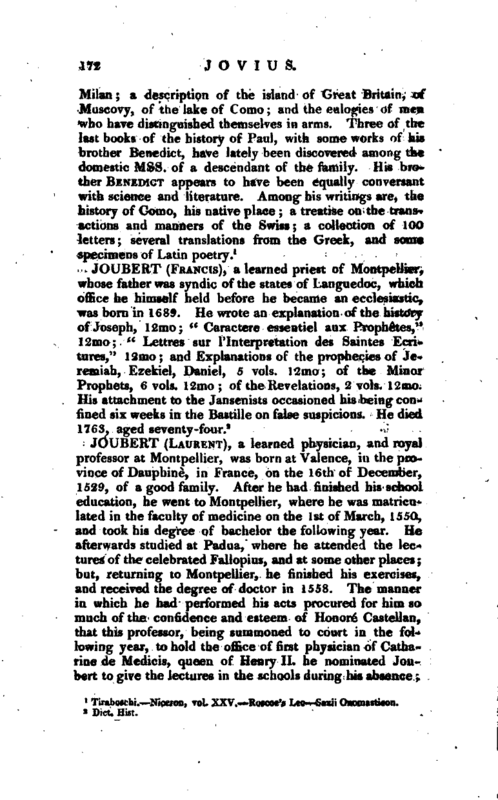 , a learned physician, and royal professor at Montpellier, was born at Valence, in the province of Dauphine, in France, on the 16th of December, 1529, of a good family. After he had finished his school education, he went to Mompellier, where he was matriculated in the faculty of medicine on the 1st of March, 1550, and took his degree of bachelor the following year. He afterwards studied at Padua, where he attended the lectures of the celebrated Fallopius, and at some other places; but, returning to Montpellier, he finished his exercises, and received the degree of doctor in 1558. The manner in which he had performed his acts procured for him so much of the confidence and esteem of Honore Castellan, that this professor, being summoned to court in the following year, to hold the office of first physician of Catharine de Medicis, queen of Henry II. he nominated Joubert to give the lectures in the schools during his absence; | and Joubert acquitted himself in so distinguished a manner, that on the death of professor Rondelet in 1566, he was immediately named his successor, in the chair. He was likewise the second successor of Rondelet, in the dignity of chancellor, having followed Saporta in 1574. He was called to Paris by Henry III. in 1579, who entertained hopes that Joubert would be able to cure the barrenness of Louisa de Lorraine, his queen. But his attempts proved unsuccessful; and he returned to Montpellier with the title of physician in ordinary to the king, and continued to practise there to his death, October 21, 1583. Gen. Dict. —Niceron, vol. 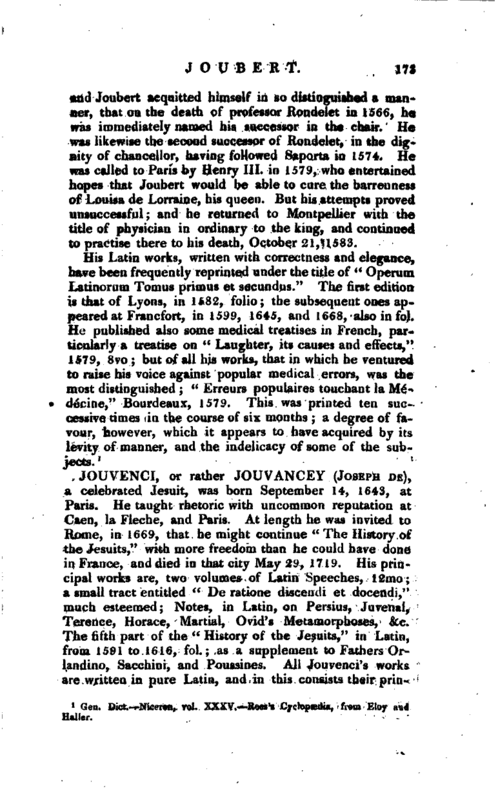 XXXV, Rees’s Cyclopædia, from —Eloy and —Haller.